So lately, we have nibbling on bowl full of berries and snacking of all things berrilicious. 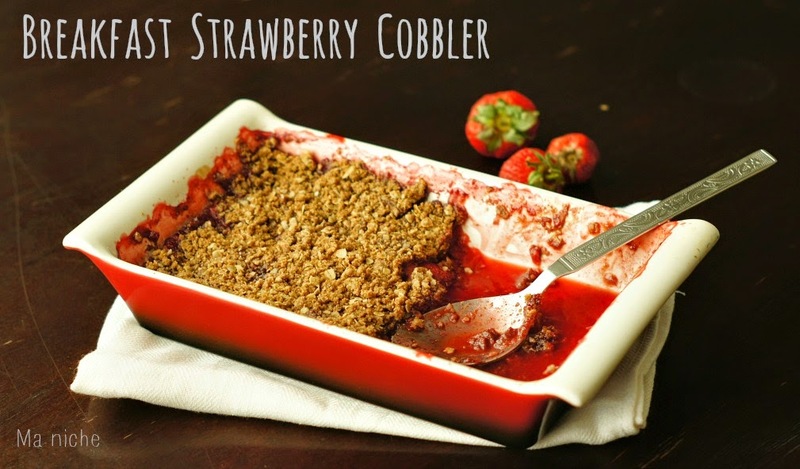 This strawberry cobbler is just one of those. 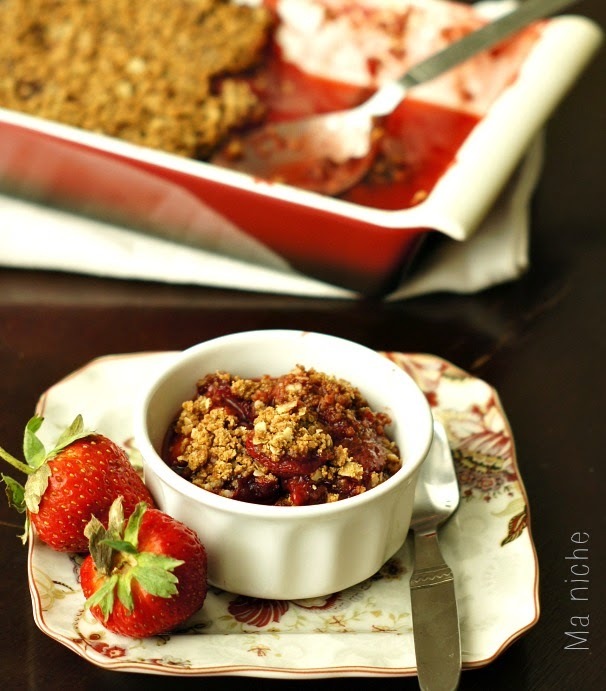 It is a healthified version of Paula Deen's Strawberry cobbler. It makes a bright and lovely weekend breakfast or even brunch if you double the quanty and serve it with frozen yogurt or ice-cream. Mix 2 tablespoons of sugar with the sliced strawberries and keep them aside for at least 30 minutes. When ready to bake, center the rack and heat oven to 350 ° F.
Stir the cornstarch into 1½ teaspoon of water and keep aside. Over medium heat, simmer the strawberry sugar mixture for 5 minutes. Then stir the cornstarch solution into it and cook for another couple of minutes until the mixture thickens. Pour the strawberry mixture into a 5×8 inch baking dish or three 6 ounce ramekins. Mix the remaining ingredients, that is the brown sugar, oats, flour, ground cinnamon, ground candied peel and peanut butter. Rub them together just so that a crumbly mixture is formed. Evenly spread the mixture over the strawberry filling. Now bake the dish in the preheated oven for 25-30 minutes or until the surface is nicely browned and the strawberry filling bubbles along the edges. Treasure Box Tuesday, Take a Bow. This looks delicious! We have quite a few gallons of strawberries in the freezer from our picking excursion earlier this spring. 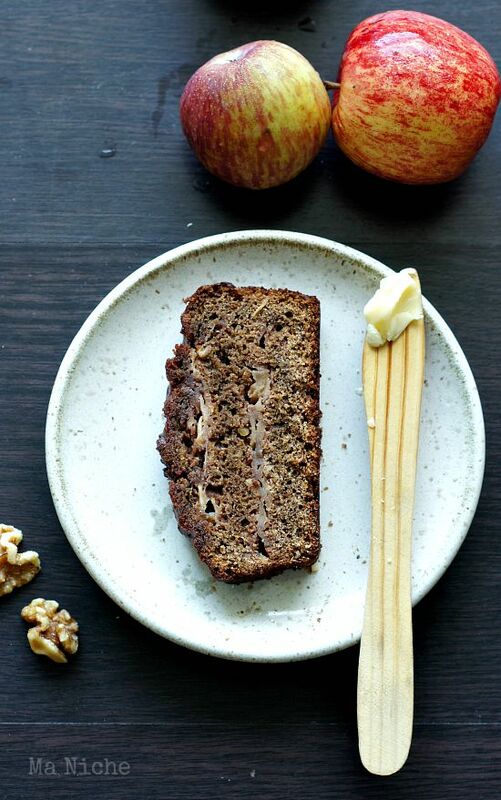 I'll be thawing some out for this recipe! Thanks for sharing. Pinning! I meant berry and not beery! This looks and sounds fantastic - love the combination of strawberries and peanut butter... And it's so true about berry-picking. I went strawberry picking last year and it was so difficult to stop! Yum! I love strawberries, and this looks so good. Visiting from the linkup. I hope you are having a greet week! I love the combination of ingredients in this dish! I cannot get enough of strawberries right now. I wish we had them available to us all year round. It's so nice to go picking and enjoy the sweetness of locally fresh. What a pleasure to find your beautiful blog! Visiting from Lets Get Real Fridays. Enjoy your weekend! 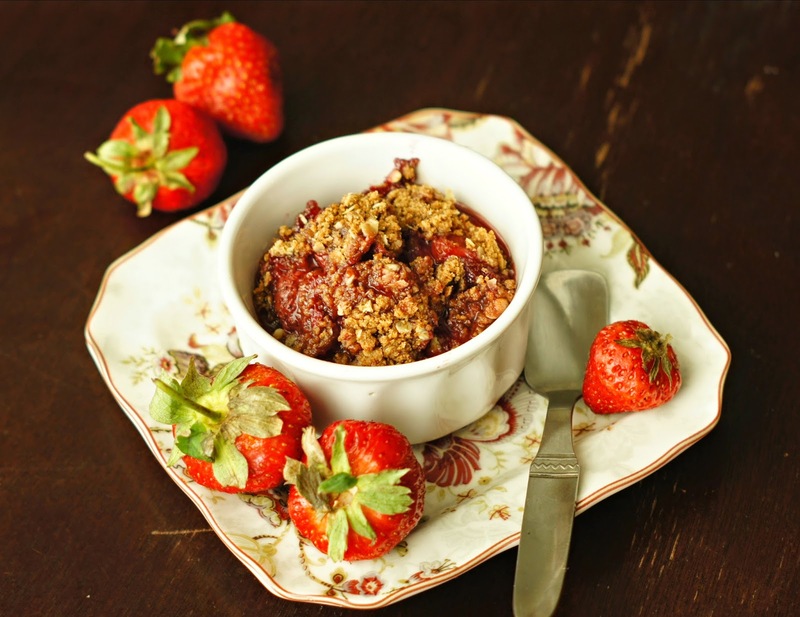 I love how you used all those beautiful strawberries- cobbler for breakfast is going to be VERY popular!! I enjoyed seeing the pictures of your family enjoying their trip to the strawberry field. Priceless memories made that day! 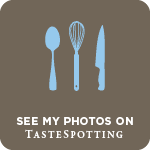 Thank you for linking up to Tickle My Tastebuds Tuesday last week. As one of the co-hosts, I will be featuring your recipe on Tickle My Tastebuds Tuesday this week on my site, Detours in Life. Congrats! Please stop by and grab a feature button when you get a chance. 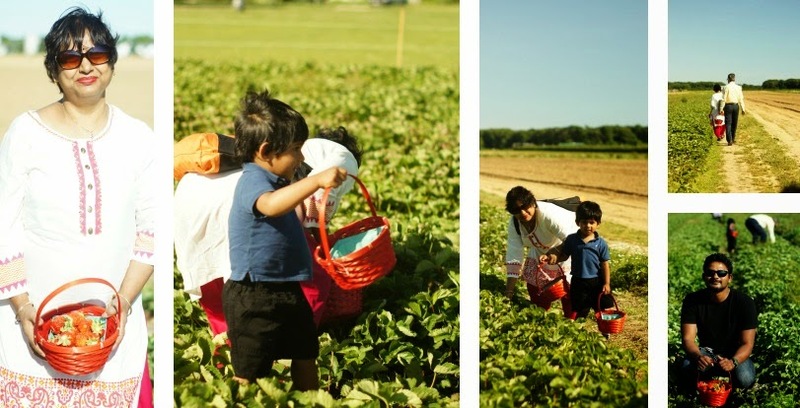 I used to bring my kids when they were little, so much fun to berry pick. Thanks for sharing on Foodie Friday your cobbler and your other wonderful recipes. All pinned. Thanks for stopping by. It was nice having you here. Have a good day. Take care and come back soon. Discalimer: All content provided on this blog is for informational purposes only. The owner of this blog makes no representations as to the accuracy or completeness of any information on this site or found by following any link on this site. The owner of http://myniche-myspace.blogspot.com/ will not be liable for any errors or omissions in this information nor for the availability of this information. The owner will not be liable for any losses, injuries, or damages from the display or use of this information. This terms and conditions is subject to change at anytime with or without notice.